In 1911 Arthur (13) was working as a farm lad. 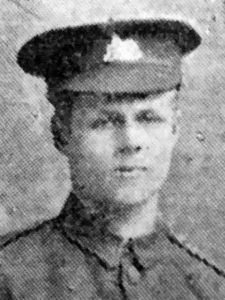 By May 1915 he was working as a valet when he joined the Lincolnshire Regiment in Nottingham. He joined a battalion in the field in Feb 1916 and was promoted to L/Cpl (unpaid) in Aug 1916 and (paid) Jun 1917. He qualified as a machine gunner. In Aug 1916 he was sent to hospital in France with actute cervical adenitis / abscess in the neck. 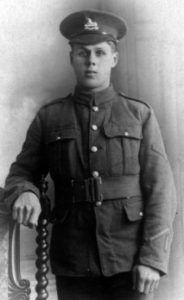 He re-joined the battalion in October but was wounded in Nov 1916 with a bullet wound in the left shoulder and shrapnel in his left hand. He was sent to hospital in Rouen, then on the Carisbrooke Castle hospital ship to England and by train to Edinburgh War Hospital. He was discharged in Feb 1917 and went with his battalion to Ireland. In Sep 1917 he was sent to Ripon and then to the Lincolnshire Regiment depot at Grimsby. 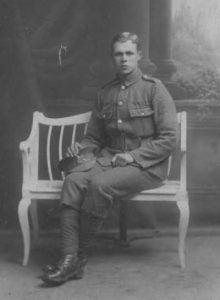 In Mar 1918 he was transferred to 8th Battalion North Staffordshire Regiment and went back to France a month later. In August he was promoted to full Cpl. He was killed by an artillery shell on 20th August 1918 during the allied advance through Flanders.